As the subtitle says, and as the drawing on the cover indicates, this book is written for kids. Or at least for people trying to learn something on a very rudimentary level. I suspect that for that fifth or sixth grader, interested in computers and with enough interest in computers, this might be just the right way to explain it. Author Eric Weinstein approaches this by telling a fantasy story and correlating the needs of the characters in the story with the needs of the Ruby programming language. It is a very clever means of teaching and I can easily see this as a series of classroom lessons. Weinstein also does a nice job of building on each chapter, taking the young developer through the process and learning the important steps – syntax, strings, if, elseif, else, loops, arrays, and so on. I am not a teacher, however, and my own children are likely beyond this level of learning, so it’s very difficult for me to say how it would go over with the target audience. I think it would work well and would want to see this available in my local library. Looking for a good book? 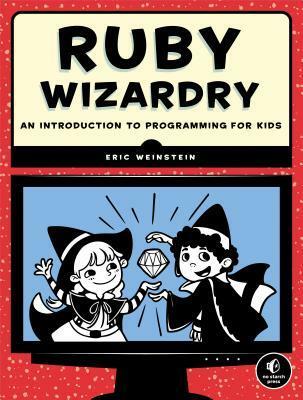 Ruby Wizardry by Eric Weinstein is a software programming book for children, told through a fantasy narrative, with some good lessons in the Ruby language.